His Infernal Majesty spreads gothic wings over the U.S. masses. Ten equally concise, irony-free, gothic-rock mini epics make up H.I.M. 's (His Infernal Majesty) Love Metal, a commercial rock record that finds the popular Finnish quartet fine-tuning their sound almost to the point of formula and redundancy. But songs as grand as "The Funeral Of Hearts", "Beyond Redemption", or "The Sacrament" trample this petty complaint: they bristle with swooning pop hooks, a heavy yet harmonic sound, laments about love, death, and forgiveness (if not much else), and an assured sense of songcraft. If you can get past the "heartagram" adorning the front cover of this album, there is a lot to like about Love Metal. One of only a few hard-rock acts to have mainstream success outside their native Scandinavia (I'm told they are huge in Germany), the band has been a guilty pleasure of mine for many years. Finally landing stateside almost two years after its original release, this album stands as an amalgamation of the band's previous three records. Metal fans may snicker at the band's yearningly romantic lyrics, and may be turned off by this record's loftier gothic rock aspirations, but it's hard not to admire a record so keenly aware of its own strengths. Throughout Love Metal there is a reliance on "quiet-loud-quiet-loud" dynamics and standard pop-metal balladry, but H.I.M. avoids cliché by filling the record with a number of inspired industrial production "tricks" and instrumental flourishes that add, rather than distract, from the record's overall pull. 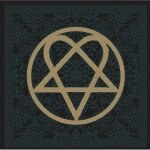 Aforementioned "The Funeral Of Hearts" finds lead singer Ville Valo extolling the virtues and pitfalls of love before the band kicks in behind him, rescinds, and then kicks back in again. It might be formula but it works, in large part because Valo is able to communicate the same urgency and sense of drama in his vocal delivery as the band does in backing him. Without this, some of the more portentous aspects of the band's material would fall flat on its face. The record ranges stylistically from the atmospheric "Circle of Fear" to dirges like the opening "Buried Alive By Love," and "Endless Dark" without really a misstep. Piano and a driving rhythm section make aforementioned "The Sacrament" another standout, and a memorable chorus anchors "Soul On Fire." This is just a strong bunch of songs, perfectly sequenced, with only "This Fortress Of Tears" and "The Path" standing out as too middle-of-the-road. The rest of the record kicks and spurns to lesser effect, but it's still affecting. The record repeats its tricks over and over again but it never gets tired, like successful variations on a well-worn theme. This will certainly change as they've recently signed to Sire Records, who will give them worldwide distribution, and are currently recording their debut for the label. A former manager of Hanoi Rocks -- another Finnish export -- also manages them. You can draw your own conclusions, but this is a band primed to break the piggy bank, and no one is doing the whole gothic rock thing as convincingly as H.I.M. are right now.